Easy French Little Red Riding Hood / Le Petit Chaperon Rouge is a simple bilingual book and CD pack for parents/teachers wishing to introduce French to young children through immersion in the language. The classic fairy-tale of Little Red Riding Hood is presented side-by-side in both French and English in the illustrated story book. Simple narration and everyday dialogues feature on the CD, so that children are able to hear correct French pronunciation. Parents or teachers having no or limited previous knowledge of French need not worry about pronunciation - the accompanying CD does it for you! The CD includes engaging readings of Goldilocks in both French and in English - you can read along with the narration or learn alongside the children! 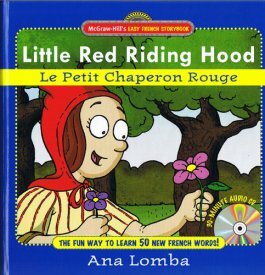 The dual-language text in Easy French Little Red Riding Hood / Le Petit Chaperon Rouge is simple and so parents need not have any previous knowledge of the langauge to read this book with their child. Full parents' notes on how to get the most out of this book are included. Each French word is accompanied by a phoenetic English spelling beneath it.